Dedicated to the well being of dogs in our care. At Play All Day, we make a big investment in our staff. Our staff members are committed and passionate about the well being of your dog. All of them are trained over a four-week period and have to show competencies before they’re allowed to manage a dog group. The most important skill they learn is understanding dog body language. Dogs speak a language, we just have to understand it and interpret it. There are very strong cues that dogs will give us to let us know if they’re uncomfortable, if they’re happy, if they’re frightened. We just have to listen. I have spent my life in the company of many extraordinary dogs and dog people. I am a lifelong student of dog behavior and training. I have a special interest in, what I call, “The Art of Being a Dog”. Simply put, this is allowing dogs to be dogs and understanding their need to be what they were intended. I am a nurse by training and also spent many years in healthcare administration. Along with my work history, my work with Golden Retriever rescue, over many years, has prepared me for this endeavor. And most importantly, my work with introducing foster dogs into my home has helped me develop skills in creating fun and safe multi-dog environments which, of course, is vital to dog daycare. 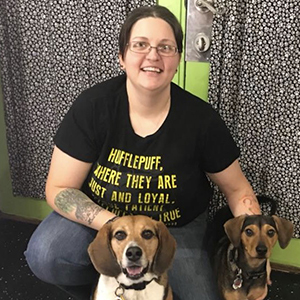 first became acquainted with the concept of dog daycare when she had an over-active, extremely social Beagle, who was driving her to exhaustion, trying to keep her busy and out of trouble. Daycare was truly a Godsend for her (and Dee). 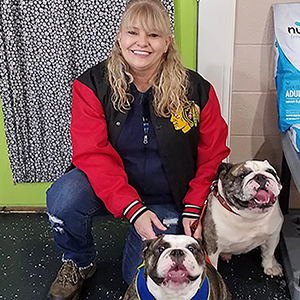 Dee came to Play All Day soon after it opened in 2011, after a 35-year career as a Medical Lab Technician, and feels so very privileged and blessed to have her Dream Job” of spending time with so many wonderful dogs. She also enjoys giving baths and doing nails. grew up in Peoria and is the youngest of five. Her mother worked as a Veterinary Assistant when Kate was a child and she remembers thinking that her Mom had the coolest job around. 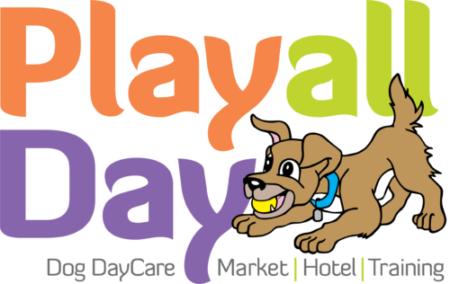 Kate has been with Play All Day since 2012. As one of our earliest employees, Kate learned along with us as we built the business. She is our Manager and oversees daily operations, staffing, and customer service. She also is a Play Group Attendant and is becoming an expert in daycare operations. had many dogs growing up, but the first she called her own was Mama Mia, a Blue Merle Great Dane. She was a true companion for Sarah for 7 years and she still misses her every day. Sarah and Mama Mia did everything together, which helped keep Sarah out of trouble through most of her 20’s. She was Sarah’s heart dog. Her current dogs are Ebon and Jocelyn. 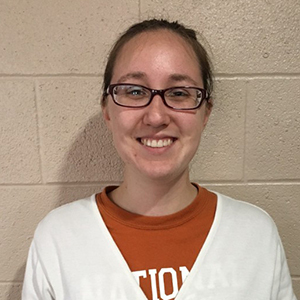 Sarah has been with us since 2013 and is a Play Group Attendant. She recently took on the role of Facility Supervisor. has been with Play All Day for quite a while as a daycare client, bringing her German Shepherd, Sage. Sage was the impetus for Brandi to really study dogs and learn everything she could about dog behavior. 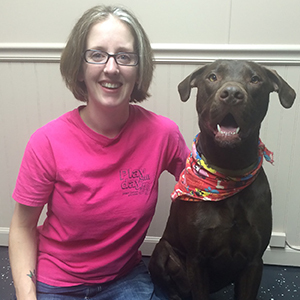 His behavioral issues challenged Brandi and she discovered her joy in training and watching him grow. Brandi has a full time job in computers, aside from Play All Day. 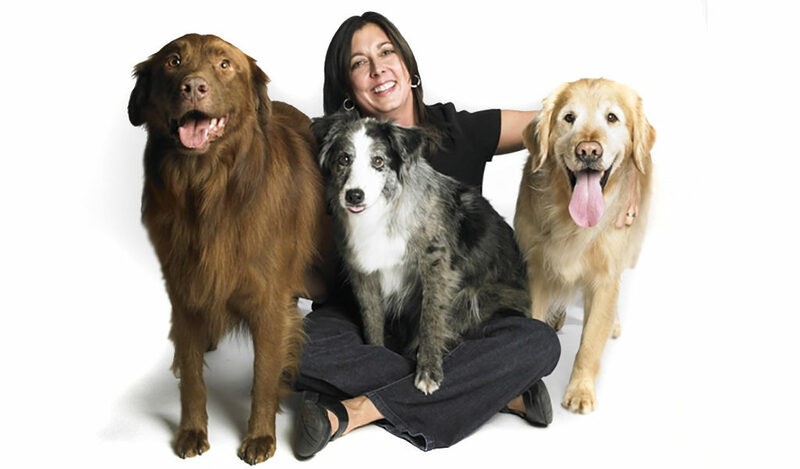 Her experiences with Sage motivated her to mentor with Ann Goyen, Canine Behavior Consultant. 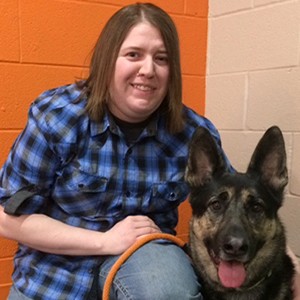 Brandi helped Ann with her classes and is now Play All Day’s lead trainer. started working with us in 2015. She is a Play Group Attendant. Kim worked as an Occupational Therapy Assistant before staying home to raise her daughters. Back to work in 2014, she chose a different career path and took a job with a new pet service called Dog Jog. 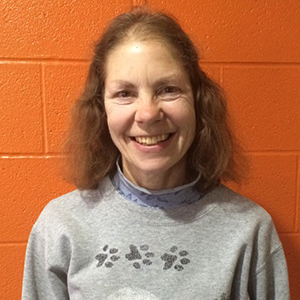 It combined Kim’s passions for dogs and running. 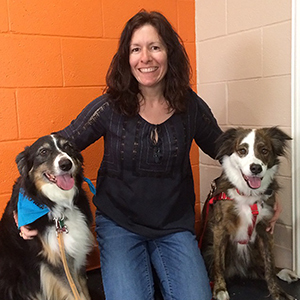 Her dog Maxx is a mutt rescued from Kentucky and Sara is a senior Border Collie/Australian Shepherd and a registered therapy dog, volunteering with the Peoria Humane Society Special Pals and Paws to Read Pet Therapy Programs. joined the Play All Day team in the spring of 2015. She loves Beagles and Magic is her main man in that department. She also has cats, Dizzy Devil and Maverick. She has been married to Eben for 7 years. Tera has a degree in Human Services and came to us from The Children’s Home where she had worked for several years. Tera enjoys her tattoos, Gaming, books, movies, concerts, music, musicals, and the Cardinals. Tera is an advocate for Human Rights and also a self-proclaimed Geek. 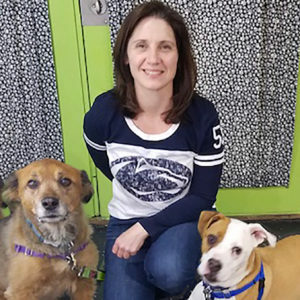 joined Play All Day in early 2016 and is now considering that she would like to work with dogs in some capacity or another as she chooses her career. Niki has 3 dogs. Lucky is 15, Trixie is 10, and Heidi is 6 years old. Niki’s new love is her 8-year old horse, Jasmine. 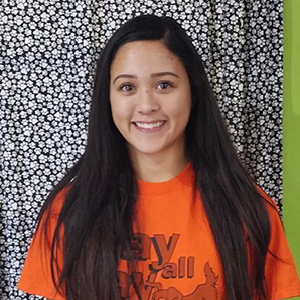 Niki joined Play All Day as a high school student and has been working her way up from cleaning responsibilities to secondary Play Group Attendant, and will now be working as the Primary Play Group Attendant in groups. has been dog sitting and dog walking for years. 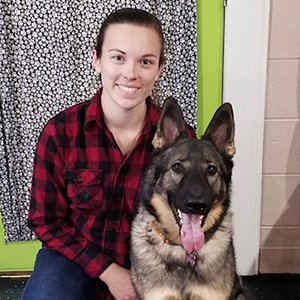 After deciding that she would like to pursue a career in dog training and behavior, Play All Day seemed like the perfect opportunity to develop those skills. Andrea joined us in May 2016. 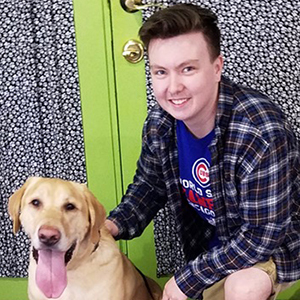 She is also involved with the Body Project, a Bradley University organization dedicated to promoting positive body image, health, and body acceptance. Andrea interned with the Body Project while in college, but loved the project so much she has remained as a volunteer. is the perfect example of “perseverance pays off”. He submitted his resume with Play All Day three times before a job opened up. He joined the Play All Day team in January 2016. Prior to working with Play All Day, he was a Manager at Dairy Queen and is also a Certified Nursing Assistant. Bryce’s love of pets comes naturally. He’s always had dogs in his home. Currently, he shares his home with a Bloodhound, Woody Nelson, a Labrador, Finn, and an English Bulldog named Frank. is currently attending Bradley University and getting a double major in Biology and Mechanical Engineering. She plans to pursue a career in biomedical engineering. 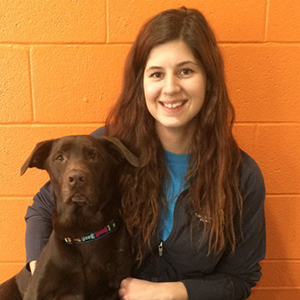 Megan is an active member of Paws Giving Independence and currently fostering Rocky. She has been horse back riding for almost 12 years (eventing) although she’s currently horseless. Megan’s other hobbies include hiking, reading, sketching, and painting. 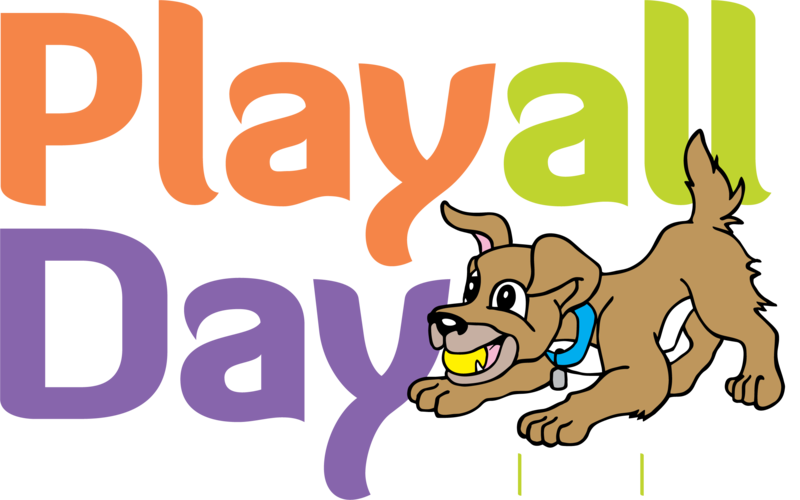 is one of our Trainers in Levels Classes, and provides Day Training to our daycare. She also volunteers her time walking dogs at PAWS / PCAPS. 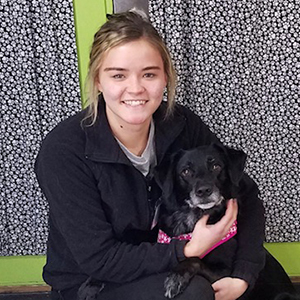 She volunteered at the Humane Animal Welfare Society (HAWS) of Waukesha, Wisconsin where she began to learn more about the science of dog behavior. 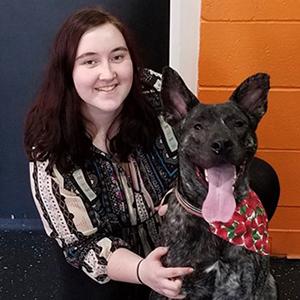 She adopted a dog from the shelter with some behavioral needs and wanted to learn as much as possible to improve her dog’s quality of life. She is currently finishing a 3-year program to be a certified dog trainer. 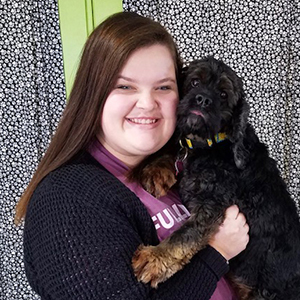 graduated from high school in 2018 and is planning to pursue a major in veterinary medicine. She would like to work at a Veterinarian clinic. She had a dog, named Boo, who was a pointer mix and two cats named Chewy and Milkshake. Crystal started working for Play All Day, as a Co-op student, in 2017. She claims that working at Play All Day gives her some experience that she needs for her future career. Crystal works as a dog runner, secondary attendant, and cleaner. is a Cleaner, Dog Runner, and Weekend Secondary at Play All Day. She is currently pursuing a degree in Social Work/ Counseling. Hannah is a Young Life leader in Washington leading high school girls. Hannah has always had a love for animals. She always had cats around the house and every Christmas would ask for a dog. A friend of the family gave Hannah an English Cocker Spaniel named Chip. She now has an American Cocker Spaniel named Lady Liberty and a cat named Angle.